You’re getting ready to go out or getting ready for work and you pull out your favorite outfit only to find that the zipper’s stuck or there’s an oil stain you hadn’t noticed before. Of course you feel annoyed and probably think that you’ll have to spend money to replace the older item. But with just a simple tip or hack, you can save your favorite outfits from being thrown in the trash. Down below I found some awesome tips and tricks for fixing clothing and making sure that they stick around a lot longer. So check them out and then head to the original source to find even more hacks! Have you ever been pulling a shirt or sweater over your head, only to find that you got makeup smudges around the neckline area? Well just use shaving cream to get rid of any smudges. It’s that simple! If you have an oil stain on one of your favorite tops or bottoms, then just let baby powder soak it up overnight. Get rid of any armpit sweat stains with lemon juice. Just squirt some on and let it sit 10-20 minutes before washing. If you notice a small hole in your tights, just use some clear nail polish to stop it before it becomes a real run and destroys your nylons or thermal tights. If some of your favorite black clothing is starting to fade (or is already faded), just buy Rit Dye (about $3) for a quick fix. Unstick your zipper by rubbing crayon on both sides. 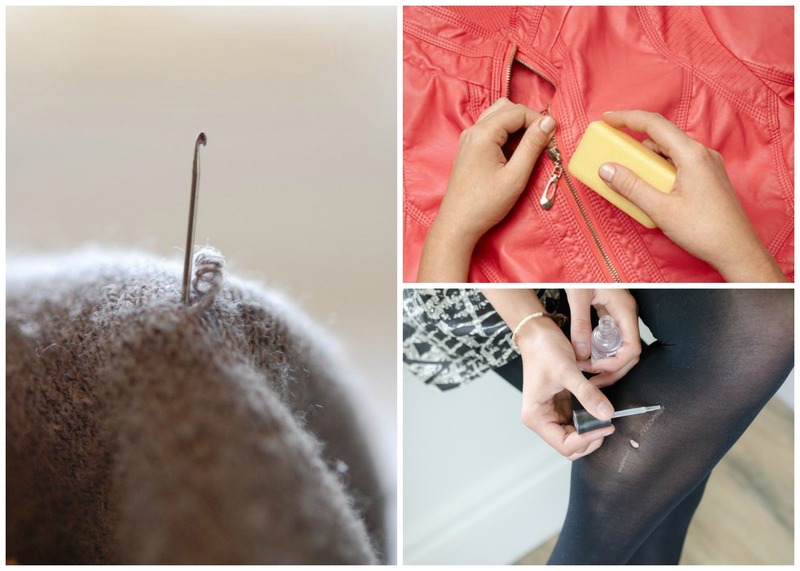 It’s an easy fix and saves your favorite jacket! Make sure a button’s thread doesn’t become unraveled by putting clear nail polish over the top of it. If you find that the front of your flats has gotten a bit frayed with time and wear, try this easy tutorial to bring them back to life! Get rid of pulled threads easily with a crochet hook. Pumice is a great way to de-pill your sweaters and have them looking new again for the fall and winter seasons. Another way to unstuck a zipper is to use soap. It keeps things easily gliding and it’s a pretty simple hack. If you have a lot of favorite outfits, then there’s no reason why they can’t last years instead of months. You can keep that old sweater or your beloved pair of flats around for a long time by just trying a few tips and hacks. Almost everything has a fix, so why not find one for your clothing pieces and save money? Now if you have any questions on clothing fixes, let me know in the comments down below! I’d love to hear about them! I love your ideas for so many different things! On your stain removal post you say to use baking soda & water paste on perspiration stains. Within that post it says to leave it on the stain no more than ten minutes yet also says to leave it on an hour. Please let me know which one is correct. Wow, the cap toe idea is really unique. What a great fix! Thanks for all these ideas.